The office is a classic setting for films, sitcoms, and half-witted comic strips. You have office politics, cubicle decorating and the classic fridge-heist (which often results in passive-aggressive notes about not taking something with someone else’s name on it). But despite all of these easily joked about and exaggerated quirks of office life, there’s a reason offices have survived the interconnected technology age. The social interaction not only can create a sense of community, but can encourage higher productivity, especially in creative fields. There is, however, a whole segment of the workforce that doesn’t have the opportunity to be surrounded by like minds day in and day out – so they miss out on the collaborative and social aspects of work. Freelancers – including everyone from Web designers to photographers to accountants – generally work from home or on a rotation of area coffee shops. The same is true of entrepreneurs just starting up, before they have a brick-and-mortar space. Working from home can feel constrictive (imagine not leaving your house for five days) and distracting (don’t pretend you won’t paw at that remote), while coffee shops are loud and you’re not guaranteed a spot. The space offers eight desk spots with plenty of room to sprawl out your work, an open lounge area, gear storage, and two private meeting rooms, plus a full kitchen and robust coffee station that’s shared with the Volume One staff. Luckily, there’s a solution. Coworking spaces have been popping up around the world over the last five years, providing some relief for freelancers and entrepreneurs. At their core, coworking spaces are just rentable office space with several perks you can’t get if you rent on your own – things like high-speed wi-fi, shared printers, furniture, and more. But there is something much more than that. Coworking spaces provide a community for independent workers to join into and potentially collaborate with – whether that’s through an intense discussion about new technology trends, or simply water cooler chatter about last night’s Packer game. The recent coworking concept started in San Francisco in 2005 with The Hat Factory, a collaborative space for tech workers, and has since grown to over 700 coworking spaces in the United States and many more worldwide. 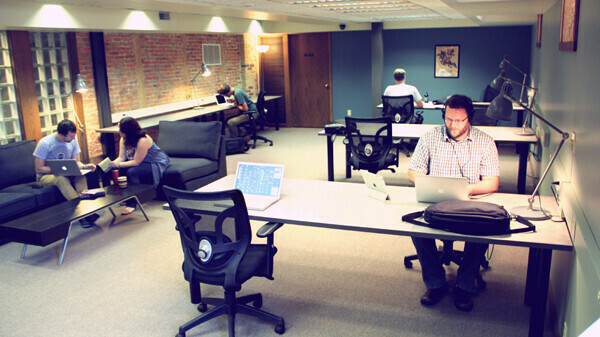 Keeping up with the trend, Eau Claire now has its own coworking space. 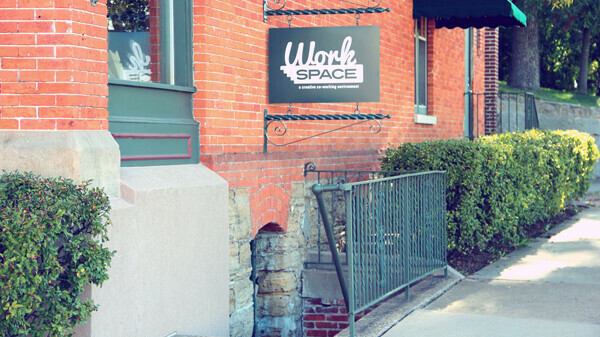 WorkSpace – which is operated by Volume One and in the lower level of the V1 World Headquarters, 205 N. Dewey St. – opened late last year. The space offers eight desk spots with plenty of room to sprawl out your work, an open lounge area, gear storage, and two private meeting rooms, which can be reserved with a month-to-month WorkSpace membership, or rented on their own. Plus, access to an even larger space, accommodating occasional groups of up to 35, can also be available. Along with the actual office space, WorkSpace also has a kitchen and a robust coffee station that’s shared with the Volume One staff to encourage more collaborative chatter. All-inclusive memberships for WorkSpace come in daily, weekly or monthly doses and include all sorts of benefits at different stages including a professional mailing address, discounted space rentals and, of course, all the free coffee your heart can handle. Anyone who wants to try out the space is welcome to a free one-day pass to see how they like it.